An east-side gallery is showing about 30 rare Navajo blankets, most of which are for sale. But you better bring plenty of spending money if you want to take one home. The blankets range in price from $5,000 to more than $100,000 each. There's no cost to admire the artistry and craftsmanship on display in "Masterpieces of the Loom: Navajo Blankets 1860-1900." The show is up now and runs through May 20 at the Mark Sublette Medicine Man Gallery, 7000 E. Tanque Verde Road. The blankets for sale range in price from $5,000 to more than $100,000 each. The gallery's first retrospective of rare Navajo blankets boasts examples of weaving from classic through "transitionals," including chief blankets, serapes and Germantown weavings. Transitionals were made in the 1890s during a period when the Navajo makers were transitioning from blankets to rugs, according to Kathleen Sublette, who owns the gallery with her husband, Dr. Mark Sublette. The chief blankets are so-called because they were so highly prized and acquired by other tribes through trading, she added. "Navajos are clans people so they don't have chiefs. But these blankets were often worn by leaders of other tribes." 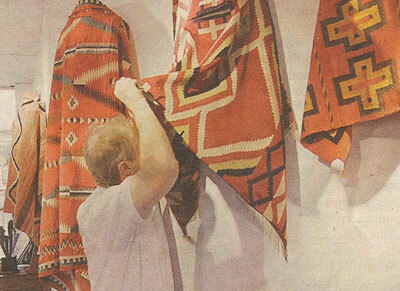 Mark Sublette adjusts a rare Navajo poncho at his east-side gallery. Accompanying the exhibit is a select group of paintings by Ray Roberts, inspired by some of the blankets on display. Mark Sublette described the blankets as "some of the best weavings of this type that you can see, whether it's in a museum or a gallery." 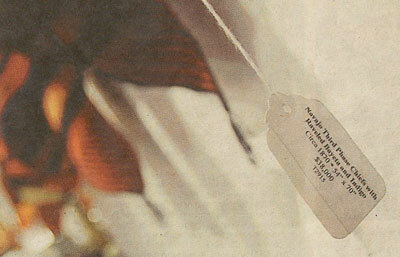 "For a gallery to have this kind of grouping of textiles at one shebang is a very, very rare thing. I have never had this many world-class Navajo blankets at one time on display, and I have been doing this for more than 20 years." The brightly colored blankets are displayed on mannequins, so the viewer can imagine how they must have looked when worn. 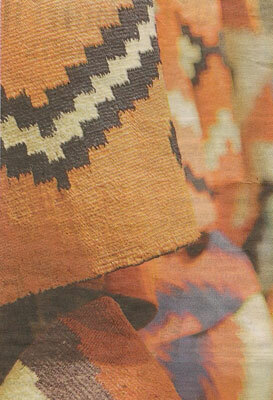 These Navajo blankets are hand-woven from wool. 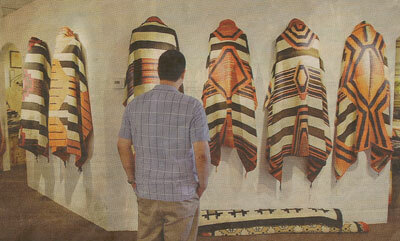 "Most times that you see weavings shown, they show them as a flat, two-dimensional object," said Sublette. "They put them on the wall, almost like a painting. Well, the reality of these things is that they were made to be worn, and if you don't show them that way, you don't really understand what the artist was trying to portray with that textile. "So by making mannequins that can be hung on the wall, which I devised, you can actually get the sensibilities of what the people looked like and felt like wearing these great objects," he added. Michigan visitor Anthony Hsu, who was in town for a conference, described the blankets as "amazing." "It's interesting to see all of the different styles that they made. I've never seen blankets like these in other parts of the country before, so it's a good educational experience." 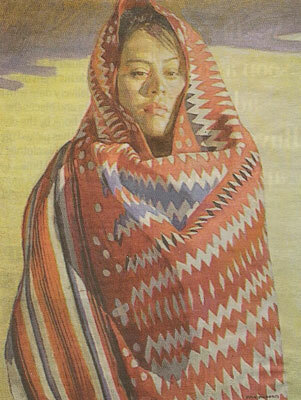 A painting by Ray Roberts, "Navajo Woman" is one of several works by the artist now on display at the gallery.